DraftExpress is a media outlet that has been covering basketball at all levels—with a special focus on the NBA Draft—since 2003. We cover basketball prospects year-round across the globe, doing our best to acquaint fans, fellow media, and professionals with the next group of athletes that will someday play in the NBA, NBA Development League, NCAA, or in professional leagues internationally. Our staff pours through thousands of hours of video every year, travels to games, camps and tournaments around the globe, and maintains a constant dialogue with the brightest minds in the business, in order to assemble the most comprehensive pool of information possible. We utilize the most modern scouting tools currently available anywhere in the world, similar to what NBA teams have at their disposal. It is our goal to provide our readers with an unbiased and meticulously researched evaluation of these prospects, honed through our many years in the field and a huge network of contacts at every level of the game. 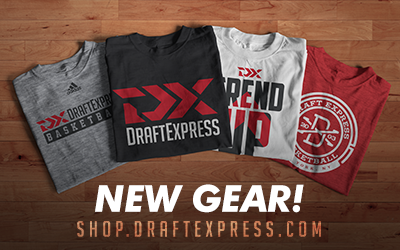 Some of the most prestigious media outlets in the world have called upon DraftExpress to lend expertise to their work, commonly citing it as an industry leader for NBA Draft coverage. You can also find our work on Yahoo Sports’ the Vertical.